Microlearning, one of the hottest eLearning trends, is catching attention amongst eLearning fraternity like never before. Our recent discussion on a LinkedIn group received a stream of thoughts and perspectives on microlearning. In this blog, we will discuss the microlearning case study that illustrates how we’ve developed and delivered microlearning course/application as performance support to reinforce existing training. veterinary best practices to minimize the diseases and improve animal health. The paraprofessionals will go through the online training which will be 2 hours seat, attempt the final quiz and get certified. On the field it was difficult for the paraprofessionals to remember every bit they learned in the training. And when they are on field they cannot access the course and look for the symptoms. As a result, they couldn’t translate their learning on the field. Most of them would call the agency or their peers to identify clinical signs and other issues instead of resolving themselves. Our client realized these shortcomings and approached Swift for a better learning solution that could be developed cost-effectively in a shorter timeframe. The long training sessions and lengthy eLearning courses loaded with lots of information, but everything cannot be remembered all the time. We then proposed bite-sized microlearning approach to provide just-in-time information to supplement primary eLearning or ILT programs. The quick and cost-effective Microlearning strategy yielded better results. Learners could pick and choose the relevant lessons at the point of need. There was a drastic improvement in their performance. Short and specific learning nuggets along with reduced cognitive overload and reinforced what has been learnt. This just-in-time solution resulted in active learning. Though microlearning is a good strategy, it is not a silver bullet for every learning solution. We must be wise enough to choose the appropriate learning strategies before we could actually design it. 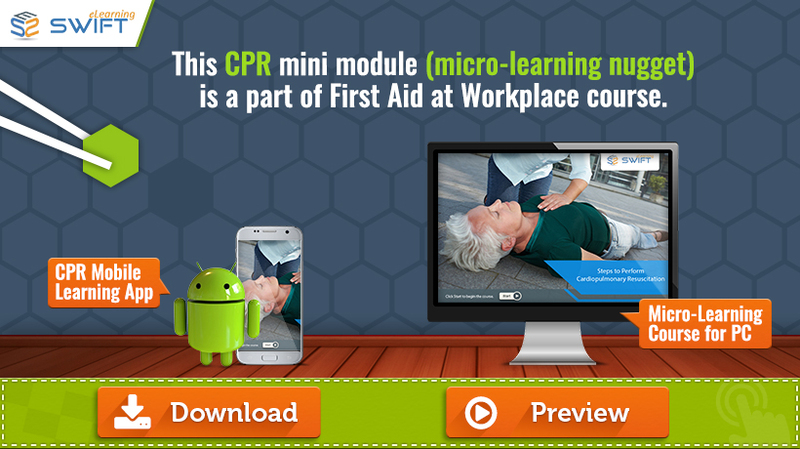 Based on the same strategy, we’ve created a sample mobile learning app on Cardiopulmonary Resuscitation (CPR) Steps which is a free download. Click the button to access the learning nugget.